€1,570 per person sharing based on 2 per room. Solo travellers should factor in a Single Supplement €195, where applicable, we cannot guarantee shared rooms. This includes: 5 days Trail Riding (4+ hours per day), 5 picnic lunches out on trail, 6 nights B&B accommodations, horse, tack & guide. Price does not include evening meals, arrival or departure transfers. € 595 per person sharing based on 2 per room. Solo travelers should factor in a Single Supplement € 105 where applicable, we cannot guarantee shared rooms. Arrival, check-in day is Saturdays. Departure check-out in Friday. Please note, for late bookings we cannot guarantee our usual accommodation, especially in peak season due to high demand for rooms. **Please note that in the event of only one rider being booked for the Full Trail. 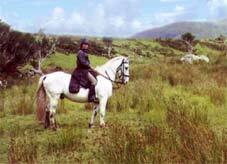 We will do a two day trail ride plus a three hour trail ride in Killarney National Park. The balance will be refunded for the other two days (Wednesday and Thursday). 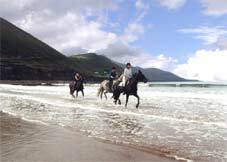 Explore the highlands of Kerry with the majestic McGillycuddy Reeks, Ireland's greatest mountain range; ride on country lanes, mountain tracks (on one of the few post-to-post trail rides available in Ireland) through forests, over bogs and on some of the beaches at Waterville and on the magnificent 6.4km (4mls) stretch of golden sand at Rossbeigh. The Iveragh Peninsula with many places of archeological and historical interest stretches south west from Killarney for nearly forty miles and is highlighted by the world renowned Ring of Kerry. The Killarney Reeks Trail operates from April to October and begins every Sunday. With riders, horses and all luggage ready for transfer, the day begins with a short trip to the base of Seefinn Mountain, where the first day's ride starts. 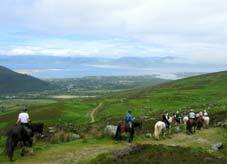 When horses and riders have been introduced, the ride heads off, and up over the Windy Gap, viewing the splendour of Caragh Lake and the valleys beyond. 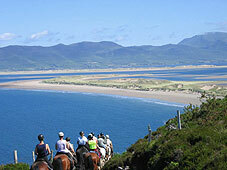 The ride then continues on to Coomasaharn Lake enclosed by Horseshoe mountain, followed by a scenic ride over an Irish Bog, finishing for the day at our stables in Mountain Stage. 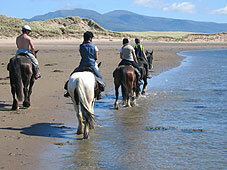 Guests may be collected from Kerry, Cork and Shannon Airports by arrangement. Deposits are fully refundable, less expenses incurred, if notification in writing is received at least 60 days before departure. 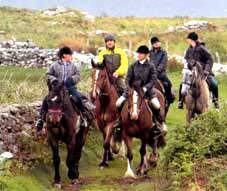 Guaranteed cheques should be made payable to Kerry Trail Ride, as opposed to Killarney Riding Stables.Visa, Access, Diners all welcome. Insurance: Killarney Reeks Trail recommend that all clients take out personal accident as well as baggage insurance, as the Killarney Reeks Trail can in no way be responsible for accident, loss, damage or injury to person or baggage. We also advice guests to take out trip cancellation insurance. Riders must be comfortable at walk, trot and canter on an English saddle in order to participate on the Killarney Reeks Trail.